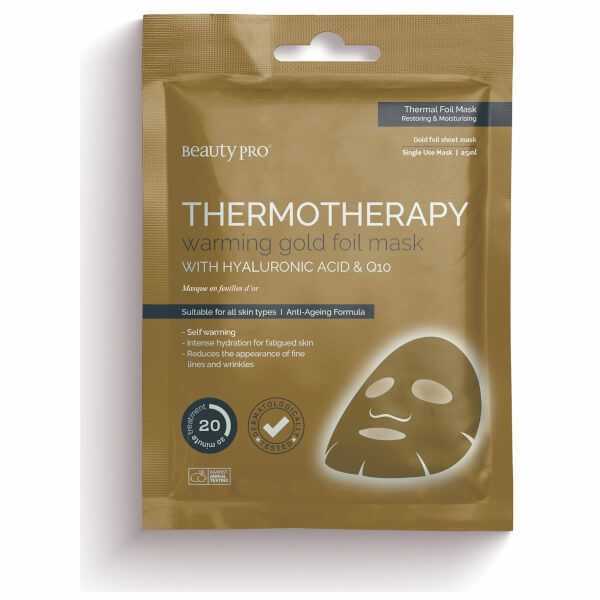 Quench thirsty skin with the BeautyPro THERMOTHERAPY Warming Gold Foil Mask, a moisturising face mask that works to improve hydration for tired-looking complexions. 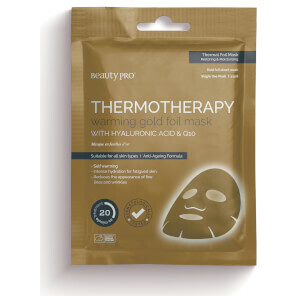 Upon application, the natural body heat reflects against the foil structure, creating a self-heating effect and improving the absorption of ingredients. A potent blend of Hyaluronic Acid and Q10 works to replenish vital moisture deep below the skin surface; helping to plump out fine lines and wrinkles and improve elasticity. After use, skin will be brighter, firmer and visibly revitalised. Cleanse the skin with water, remove mask from packaging, unfold and place on face. Wear for 15-20 minutes then remove mask, there is no need to rinse the skin. Excess serum can be applied to neck and décolletage. Aqua/Water/Eau, Glycerin, Propylene Glycol, Propylene Glycol Dicaprylate/Dicaprate, Polysorbate 80, Panthenol, Hydrolyzed Collagen, Adenosine, Glycine Soja (Soybean) Seed Extract, Caprylic/Capric Triglyceride, Sodium Hyaluronate, Hydrogenated Lecithin, Ubiquinone, Tocopheryl Acetate, Disodium EDTA, Arginine, Carbomer, Hydroxyethylcellulose, Sodium Nitrate, Glyoxal, Benzyl Glycol, Ethylhexylglycerin, Raspberry Ketone, Butylene Glycol, Phenoxyethanol, Parfum/Fragrance.